Digital advertising has evolved into an increasingly complex business tool at the forefront of modern technology. Large scale marketing now uses a combination of e-commerce tools, creative services, data analytics, and artificial intelligence to deliver messages to a targeted audience. The days are creating high-end print ads published in a glossy magazines have dwindled--and some industries, such as politics have been slower to adapt than others. The next innovation impacting digital advertising is programmatic creative. Programmatic refers to the automation of various marketing components. It refers to the bidding on and buying of ad spaces based on user data and machine learning algorithms through ad exchanges, demand-side platforms (DSPs), and trading desks. But more recently, the same programmatic user data and algorithms are driving advertisement’s creative development. This is called ‘programmatic creative.’ It enables ad content to be autonomously selected from a set of predefined creatives based on an user’s navigation history. The key performance indicator (KPI) of each ad is then analyzed and optimized in real-time. Programmatic creative produces dynamic advertisements, with creative and copy variations decided by data. The BannerFlow blog analyzed a programmatic creative ad by The Economist in 2016. The UK-based newspaper’s campaign goal was to attract new subscribers to The Economist. They embraced programmatic creative. The initial KPI was to reach 650,000 previously unseen prospects and to stimulate a change in perceptions (not just a click). 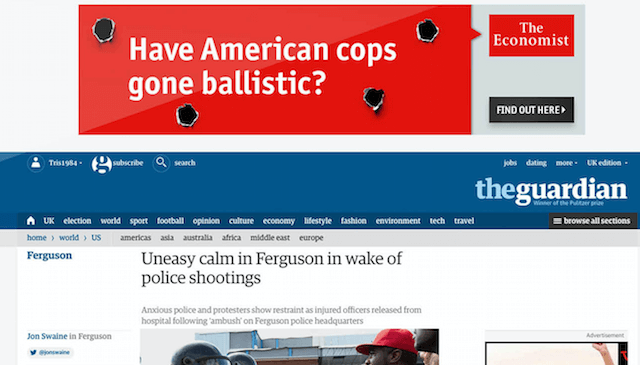 Below is a banner that linked an Economist story on U.S. police use of firearms to an article about a police shooting featured in The Guardian. More than 60 executions were created. The results of this programmatic creative push were 650,000 new prospects, 3.6m people taking action, and a campaign ROI of 10:1, on a £1.2m media budget. The entire campaign won gold at the 2016 DMAs for the best use of programmatic and gained thousands more subscribers. When the general public hears the terms automation and programmatic, they fear technology will take over all the jobs done by humans. That would mean creative decisions, copy, and ad execution would be completed autonomously. However, programmatic creative needs humans more than you think. Programmatic creative works best utilizing a business vertical approach. Rather than design a creative that works across industries, programmatic creative needs insights about industries, market and users to work best. Why? Currently programmatic creative and artificial intelligence tools available excel at performing one task at a time. For example, vacuum a floor or deliver one type of ad based on one variable. For programmatic and AI to gain more traction, these deep learning systems will need to mirror how humans process information and make decisions. Especially, how business professionals use market and human intelligence. Market intelligence is the first data set analysed companies use to make informed decisions. The data could include population age in that area, spending habits of consumers, competitive landscape, and the regulatory environment. This information fills in the gaps of what companies don’t know so they can feel more confident about making investment decisions. Human intelligence is all encompassing term describing how individuals collect, process and utilize information. This includes a person’s ability to learn from past experiences, adapt to new situations, and comprehend abstract ideas. Comprehending human intelligence could help marketers deploy programmatic creative campaigns that more effectively connect with an audience. These ads could eventually execute an ad with an emotional message or information the audience needed in real-time. One iteration of a programmatic creative political ad is IQM’s Get Out the Vote (GOTV) ads. The GOTV provide vital messages, downloadable calendar reminders and voter polling site locations directly to a targeted group of voters. GOTV ads can be programmed to appear on the sites, in the most effective sizes and frequency based on individual voter’s political preferences . 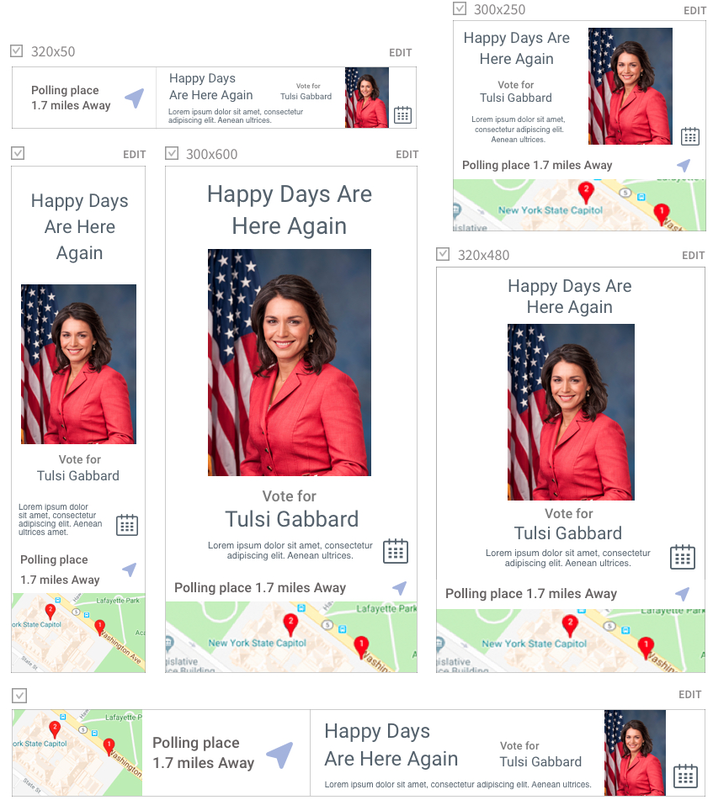 The simple combination of graphics and text produces measurable impressions and engagement rates and builds greater candidate visibility to the voting public.